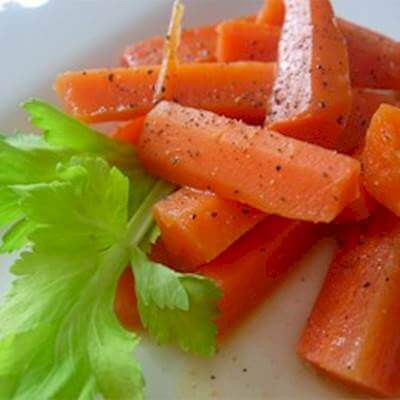 These candied carrots are flavored with a pat of butter, and a touch of brown sugar bringing out the naturally sweet nature of the carrots. This is a great side dish for fast weeknight meals. RecipeSavants.com These candied carrots are flavored with a pat of butter, and a touch of brown sugar bringing out the naturally sweet nature of the carrots. This is a great side dish for fast weeknight meals. Smart Recipes, American Recipes, Vegetables Recipes, Recipes Vegetables American Brown Sugar Candy Carrots PT40M Serves 4 Ingredients: 1 Pound Carrots 2 Tablespoons Butter 0.25 Cup Packed Brown Sugar 0.25 Teaspoon Salt & Freshly Ground Black Pepper In a large pan of salted water, simmer carrots for about 20-30 minutes until carrots are tender but not mushy. Drain the carrots and return to the same pan. Heat pan over very low heat and combine brown sugar, butter, salt, and pepper. Simmer for 4-5 minutes or until the sugar is bubbly.